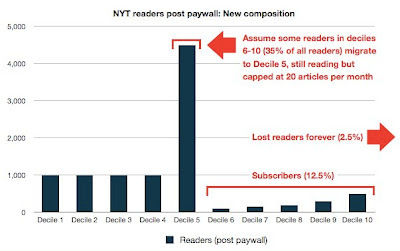 Why not take into account the likely substantial increase in page view rates by subscribers? Then they’d really be making money! 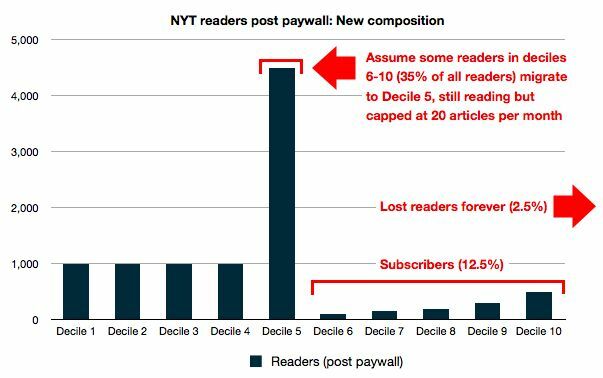 Interesting analysis, and good article but questions about a few assumptions. 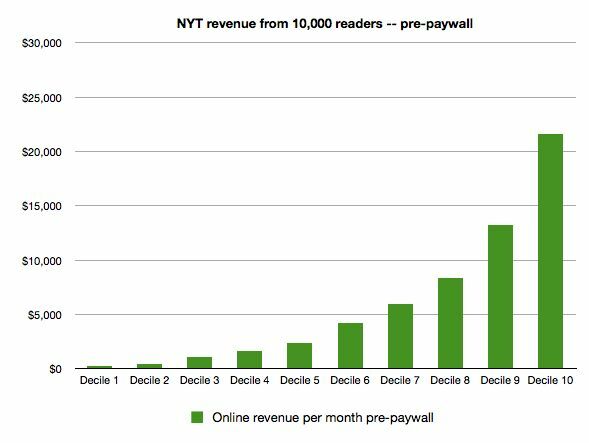 Your tiers work on articles viewed/month. I believe the “Top News” articles are still free and accessible. I would assume thats the most popular and viewed articles of the day. 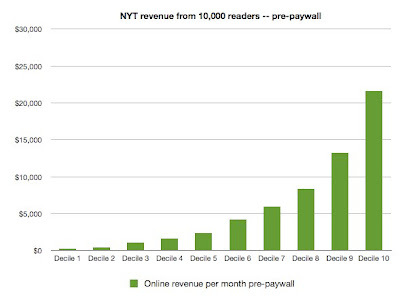 Even at a 180 articles/month – its only six per day. 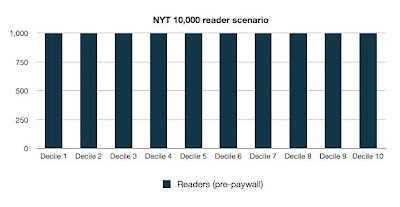 How many on average are in the top news per reader’s visit? For me, its usually all of them, but I don’t read the columnists too often. If you changed the analysis that only the top tier will have to pay, how does that affect the pricing? Also, the assumption that only 5% of of the readers will leave seems a bit optimistic. 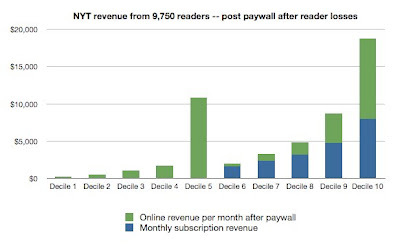 If I average six articles per day, but most are available for free, why would I pay? What happens with these new assumptions at a 20% or even 50% drop off? Good points. 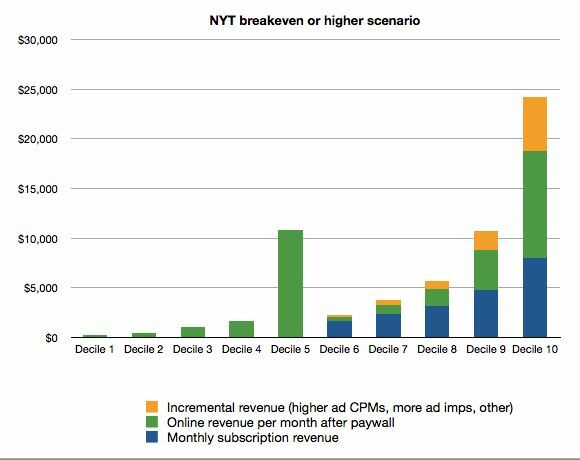 If there are more articles read in the top tiers, and if more people defect post paywall, then the Times will lose more ad revenue and make up less in subscriptions. 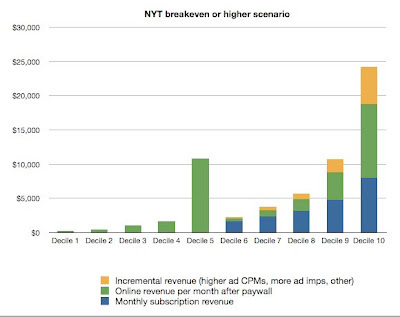 My model was likely overly optimistic but I wanted to see what it would take for NYT to break even. It is a great way to marketing their own site. Also you can go for the ipad version of the newspaper.